Stellenbosch’s Just Design is responsible for the revamp, and has this to say about its work: “Nature’s Source breakfast cereals are homely, natural, and wholesome. This is a brand with heart that comes from nature. This positioning is reinforced in the new packaging by a farm-style feel and origin, communicating that it is all-natural and authentic, despite being a mass brand. 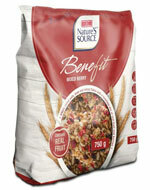 The new-style Nature’s Source features three ranges of muesli: the regular Crunch range of classic muesli; the Benefit range offering a nutritious, great-tasting alternative for the more health-conscious consumer; and the Luxury range, for more indulgent tastes, with nuts, smooth chocolate and rich flavours. Two new variants, Chocolate & Honeycomb and Rocky Road flavours, join the strawberry, yoghurt, nut and tropical sensations options in this latter range.